We just bought the Nature’s Head composting toilet. 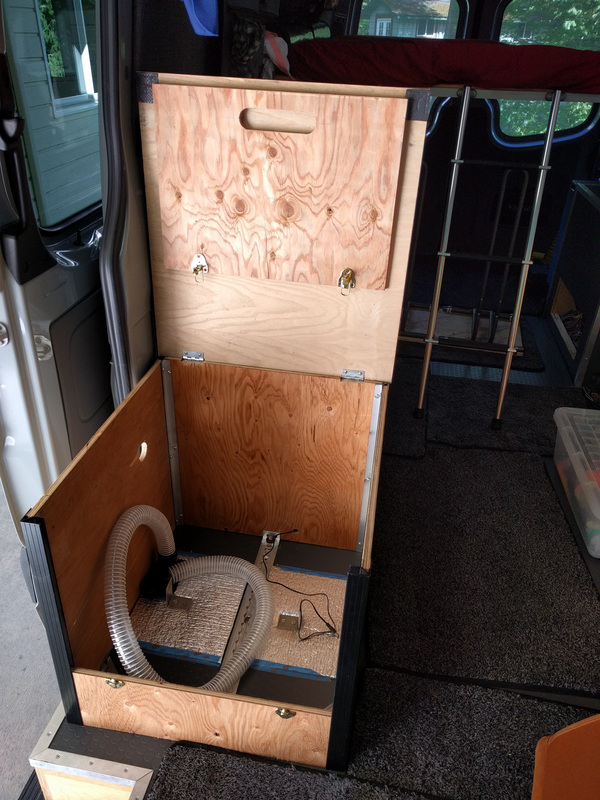 After testing it out in our spare bathroom for a week, we installed it in our van. Here’s how we chose to fit it in. We’re in the process of redesigning our van interior. Rather than using the stock crew bench in the third row position, we’re going to add a bench seat against the window behind the driver’s seat. We decided to put the toilet in a box opposite this to form another seat, so it’s ended up in the sliding door area. That might at first seem weird – who’s going to want to poop with a window right there? – but the windows are very well tinted and it’s the best place for the toilet in our setup. We’ve never used a composting toilet before. Even though all the reviews are very keen to point out that the toilets don’t smell in normal use, we wanted to be sure. So we set ours up in our guest bathroom for a week and used it pretty exclusively. In the picture, you can see the vent tube from the toilet attached to our ceiling fan. That worked OK, except the roof vent for the ceiling fan has a flap that stays closed unless the powerful fan is working. 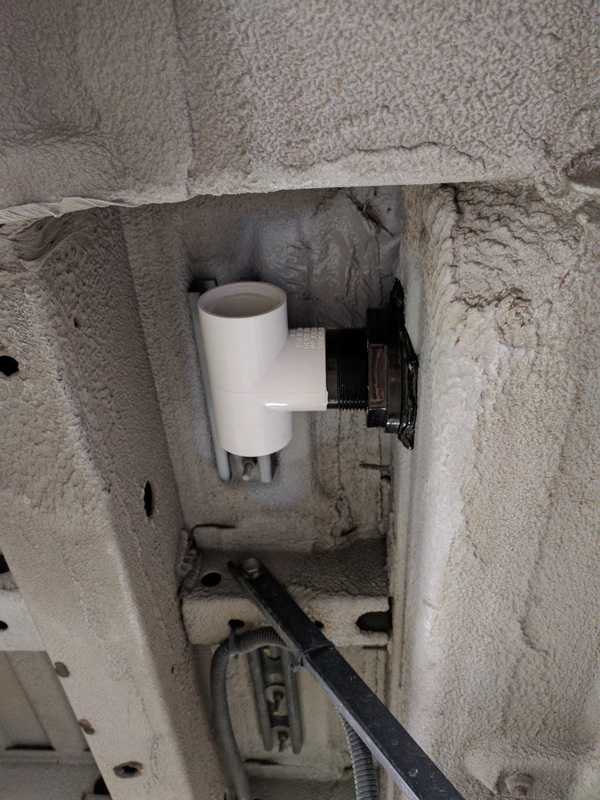 The tiny 1″ computer fan in the toilet wasn’t strong enough to open the flap, so we think we got some smells from the vent tube back into the bathroom. Other than that, the toilet performed really well. Apparently we pee a lot, because we managed to fill the pee container up in just over a day of continuous use. The Nature’s Head site suggests that the container should last for about three days. We found that is true if you’re only using it at night and in the morning, and peeing elsewhere during the day. The toilet isn’t going in a bathroom in the van because we don’t have a bathroom. Our shower is outside the back doors. Our sink is next to the sliding door. So, we decided to build a box around the toilet and just put it where it made most sense. Initially we planned on putting it in the area where our bench seat had been bolted in, back in the third row seating position. Unfortunately the dimensions didn’t quite work out. It’s a shame, because it’s a slightly more private location and it would have created a great step up to the bed platform. We may still move it there in the future if we really find it doesn’t work out where it is now. To fit the toilet in, we ended up with a 21″ tall cabinet in the sliding door space. 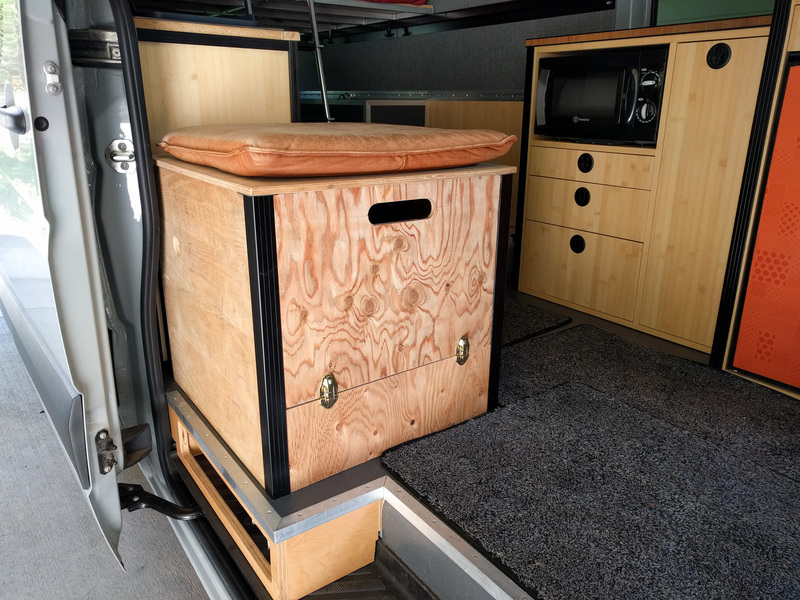 It’s a little tall for sitting on, but it works well as a temporary seat and also as a transition countertop between the space inside the van and the outside world. For the moment, we’re using a prototype cabinet built of 1/2″ plywood scraps and using road case aluminum extrusions for the corners. These things are great! The 1/2″ ply slots into the extrusion and you can just fix it in place with some self-tapping screws from the inside. It’s definitely sturdy enough for prototyping purposes. Inside the cabinet, there’s space for the top half of the toilet to hinge open backwards so we can remove the pee container. There’s also space to the side of the toilet for the vent tube and the handle for the poo stirrer. The foil faced foam on the floor is acting as a spacer. We have a piece of L-track running on the floor under this cabinet. It’s what the cabinet is bolted down to. However, it stands proud of the floor by about 3/16″. The toilet has to balance on the L-track when it’s in place. To stop the toilet from wobbling, we put the foil faced foam down on either side of the L-track. We have temporarily run a power supply for the fan from one of our 12v cigarette outlets in to the cabinet space. Later, if this all works out, we’ll tap into one of the spare power lines we ran when we wired the van. 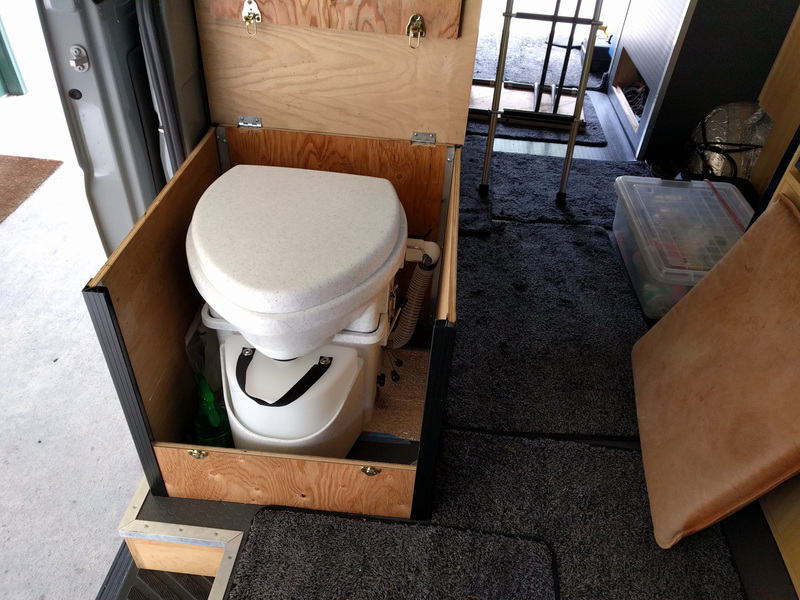 Composting toilets need to be vented outside the van. The Nature’s Head comes with 5 feet of flexible hose with 1-1/4″ connectors on the ends. Venting turned out to be relatively simple. 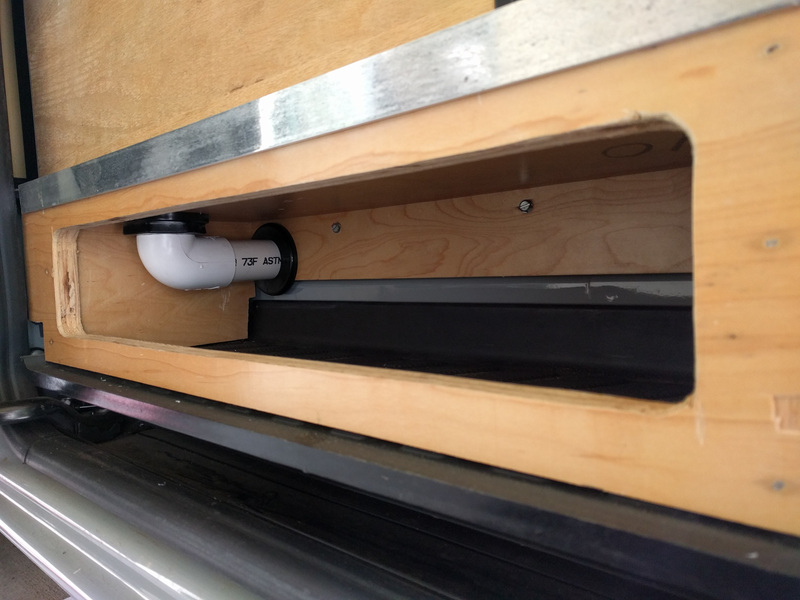 We used two 1-1/4″ ABS bulkhead grommets to run the pipe through the box we’d built in the step area and then through the vertical metal wall of the sliding door step. 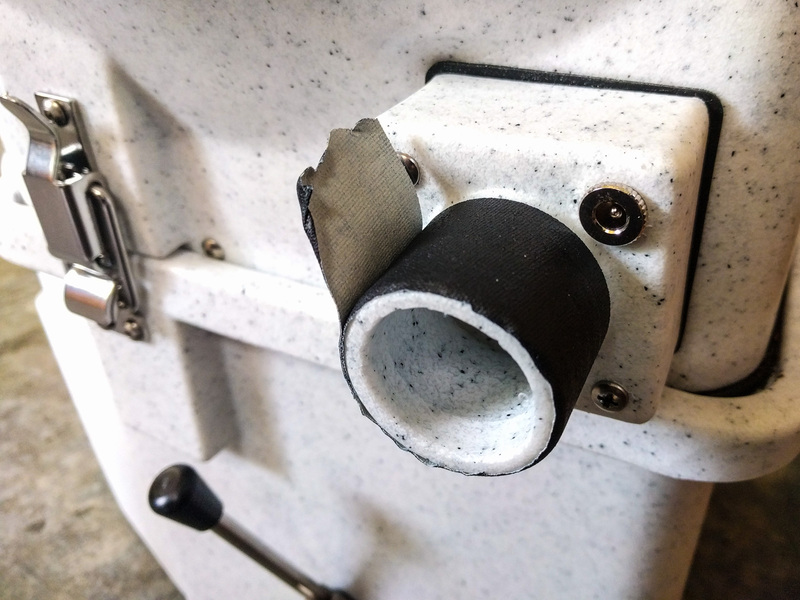 These grommets have slip fittings, so it’s easy to just slide some 1-1/4″ pipe into them, and attach the flexible hose that is provided with the toilet to the pipe. You need a 2-1/8″ hole saw to cut the right sized hole in the floor of the van for these bulkhead grommets. 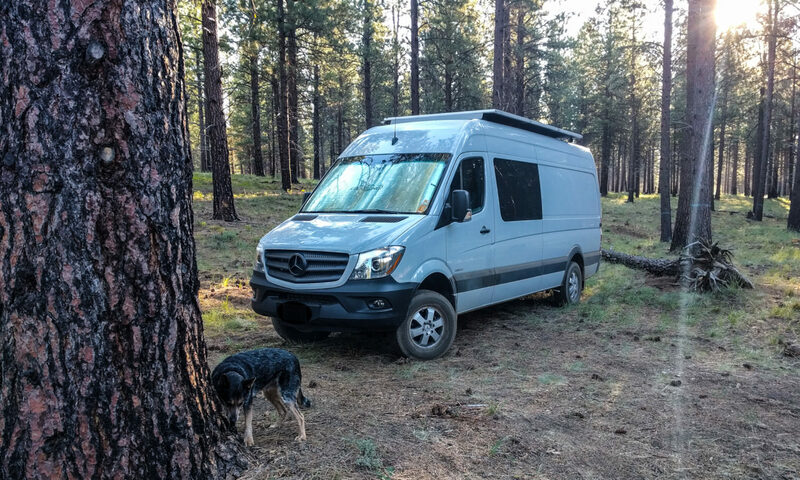 On the outside/underside of the van, we made an end cap from a Tee fitting, some aluminum screen door mesh, and some small lengths of 1-1/4″ pipe. 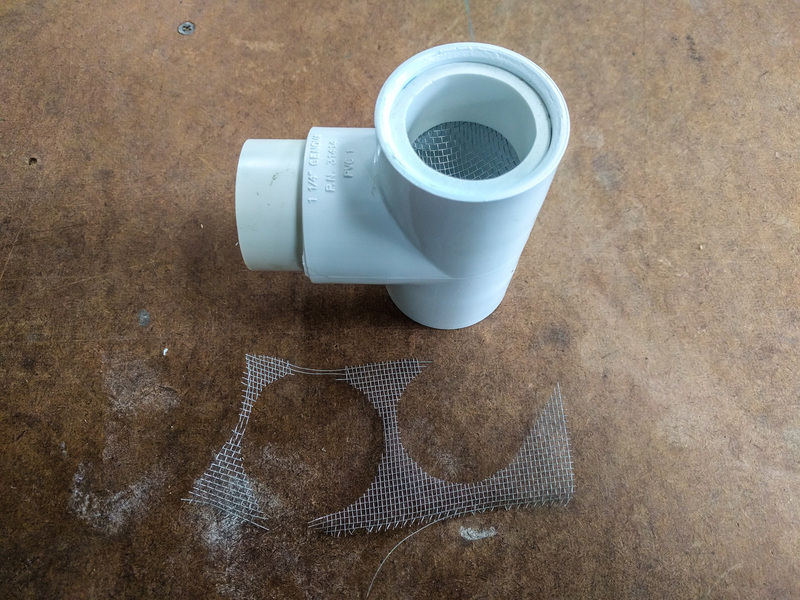 The circles of screen door mesh slot into the ends of the T, and then the short length of pipe pushes in to hold them in place. We found that a friction fit was good enough, although you could always glue them if you wanted to. Theoretically the toilet itself has a screen on the outlet vent pipe, but we wanted to stop bugs from even getting that far. 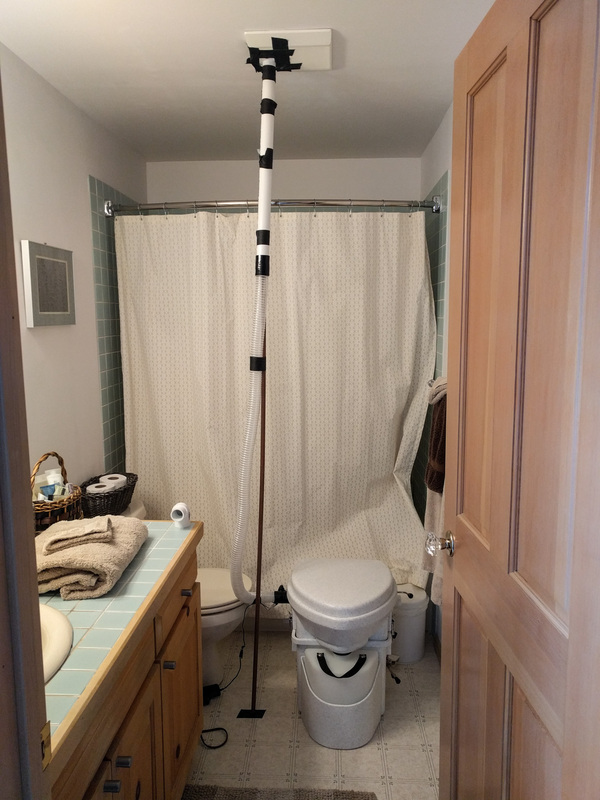 The one issue we had is that the fittings on the toilet itself are not 1-1/4″. Although the instruction manual says to use 1-1/4″ fittings, the rotational moulding is undersized and a regular 1-1/4″ PVC street elbow fits too loosely. We wrapped a couple of turns of tape around the fitting so that the PVC corner had a good friction fit. The toilet itself has two L-brackets that screw into the floor and then attach to the toilet base with thumb screws. They seem pretty sturdy. The toilet doesn’t weigh that much, even with the coconut coir and poo inside it, so we’re pretty confident that it’s secure enough. The final thing we did was re-used an old Ikea seat cushion on the top of the cabinet to make it into more of a seat. The cushion had Velcro on its underside, so we just stuck a strip of Velcro onto the cabinet lid to hold the cushion in place. So far, so good for our prototype cabinet. 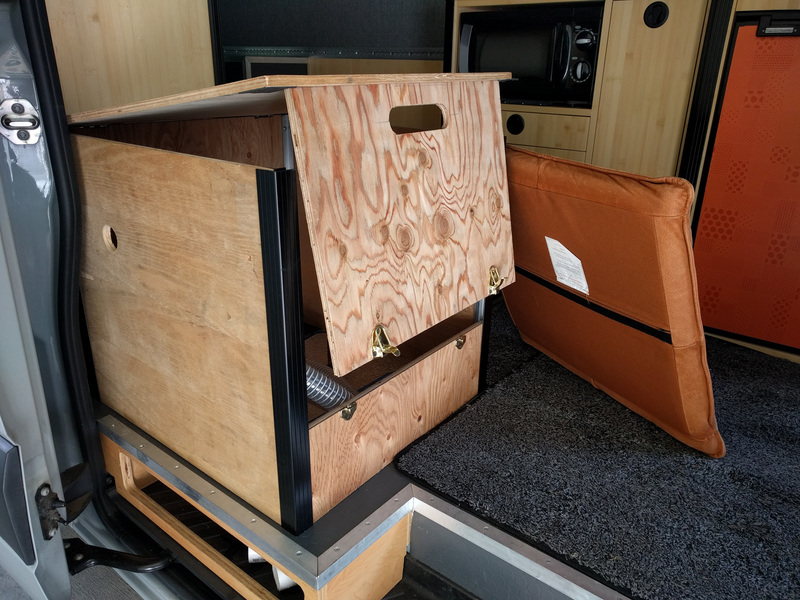 We’ll live with this setup for a couple of trips before we commit to re-building the cabinet using 80/20 aluminum extrusions and bamboo 1/4″ ply like we did for our sink cabinet. Dave, even if I wanted to enjoy the view from the throne, any onlookers might not enjoy the view of me on the throne. Good idea though! Have you guys had any issue with the vent being below the toilet as opposed to even with the vent or vented above? Ben, the vent works just fine in its current position. The vent fan is designed to run all the time, and that creates enough flow to keep any – uh – “gasses” moving through the system. In fact, we’ve found that we don’t even need the fan running full time and we still don’t get stinks in the system. Curious if you still like it there? Have you made a nicer cabinet yet? Do you have the dimensions of it? I have moved my Crew seat back to the same location, but I am considering having it cut down to a 2 person seat and installing the natures head there. Time will tell. Andy, the position works well for us and we’re planning on rearranging some of the rest of the van cabinetry so that we have a bench running under the window behind the driver, and the cabinets further back on that wall. We’ll cut the 3-person bench down to a 2-person bench and when we really need to have passengers we’ll run it in the factory position but in the two floor mounts closest to the sliding door. It should all just about fit! We haven’t made a nicer cabinet yet. We’re waiting until we do a big 80/20 order. Dimensions are roughly 21″ tall, 23″ front-to-back, and 22″ wide. Yep, that’s right. We’d cut the seat down (it actually involves taking out the middle section) and then mount it as if the driver’s side piece was missing. That would line up with the bench we plan to build out of 80/20 and place front-to-back behind the driver’s seat. Still in the planning stages at the moment. Great page and wonderful info…based on your build, I see some similarities in our process. As such, I wanted your opinion about mounting this natures head on a sliding drawer so I can stow it away into a cabinet; think the urine canister would leak? Any foreseeable issues other than the articulation on the exhaust hose? Sean, the unit itself isn’t too heavy, so if you had strong enough drawer slides or used casters at the front of the drawer I think this could work well. The urine canister is pretty well sealed to the toilet at the top and it wouldn’t slosh around any more on the drawer slide than it would just driving around. Like you say, the exhaust hose (and 12v supply for the fan) is the only real concern and I think that is easily accounted for. The hose itself is very flexible. The one issue I can foresee is unit height. The toilet is already high even mounted on the ground. Adding an extra inch or so for drawer slides would make it *really* tall. Great information. I’ve been trying to find more info on installing a composting toilet. We are planning to get a 2006 158″ wheelbase in a few months. This post is a big help. Thanks a ton! Courtney, glad you found the post useful. We’re still loving the toilet.